Hey folks, after 3 successful seasons by Bigg boss Kannada they are back again with another exciting season of Bigg Boss Kannada 4. The season is the most awaited season by the Kannada people as they are excited to know who is the host of Bigg boss Kannada and who are the contestants in Bigg boss Kannada 4. So for all the Kannada fans we are here with an exciting post regarding all the things you need to know regarding starting date and time of Bigg boss Kannada 4. Bigg Boss Kannada 4 (BBK4), is the fourth season of the Kannada reality television series Bigg Boss Kannada. The show is going to be aired on colors Kannada, everyday at 9 pm , so get reading for the grand opening of the show which going to be on 9th of October 2016.The show will be shot at the Innovative Film City near Bidadi by reconstructing the house, where it was shot last year. After the great success in its third season bigg boss Kannada is back with its new twist and turns to amaze people. Bigg Boss is a reality show based on the Dutch Big Brother pattern, where selected participants live in the house as housemates and perform a huge number of tasks to win their place in the house for survival. Each week one of the contestant is evicted from the house based on the voting from the audience. And finally who survives until the last wins the show and wins the winning amount as well. The Hindi version of the bigg boss is already so much popular and is going high in the air. The Hindi version of bigg boss is also most awaited this year as it will be featuring common people as participants in this season. Similarly, BBK4 is also going to be very popular because of its great success in the season 3 so get ready to see the grand opening of bigg boss Kannada season 4 on 9th October 2016 sharp at 9 pm in color Kannada channel. Superstar Kiccha Sudeep is back with the fourth season of Bigg Boss Kannada as the host for the show. 14 celebrities will have their every move watched by 55 cameras for 100 days and they have no escape. So, get ready for some fiery fights, red-hot romances, killer controversies and non-stop entertainment. The fourth season promises to be bigger, bolder and better! 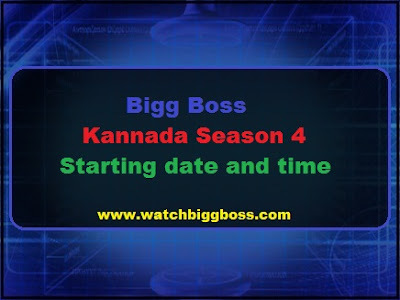 Hence this is what we have got for you through this post regarding Bigg boss Kannada 4 starting date and time | Kannada bigg boss season 4. Hope you found this content on this page very entertaining if yes then do support this show and our page using the social sharing buttons below on various social sites like facebook,twitter,Reddit,etc. We would love to hear and see your reactions on this post from the comment below so feel free to share your views on this post in the comment below. For more information regarding Bigg Boss Kannada keep visiting us regularly as we keep our site updated with ton's of fresh content for our user. Till then have a great day ahead. Thank you for investing your valuable time here on this page :) .